Classic and super durable, plus they slip on and off and have a removable footbed that allows for a little room to grow when taken out. 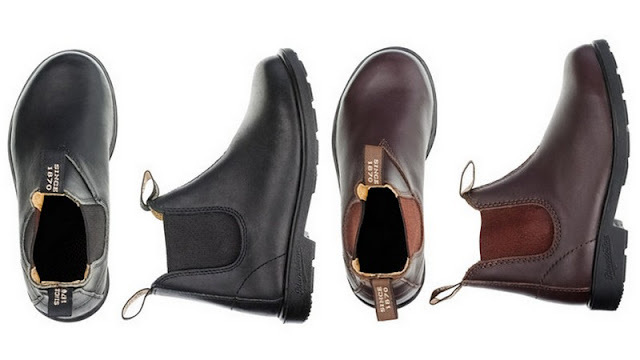 These fabulous little Blundstone boots are on sale right now at J. Crew for just $27.65, with free shipping that will still get them to you by Christmas! They had been marked down from $90 to $39.50, but with the additional 30% off of all orders today at J. Crew (with the promotion code below), the total comes to a mere $27.65. They have both black and raisin brown (shown above) in stock, available in sizes 8-11. Hurry, hurry! They are selling out quickly. And thank you, Robin, for alerting me! free shipping if you spend over $100, right? or is there another trick? Actually, all Crewcuts (kids) orders always ship for free, and there is no minimum amount. However, if you have any adult items in your order as well then you have to reach the $100 minimum to avoid shipping costs. I ordered a pair of these boots earlier today (the shoes were the only thing in my order) and only paid sales tax, no shipping. Let me know how you do... I hope you get your pair(s)! Natalie! (A bit late in my response) but Yes my husband ended up ordering the boots and there was no shipping charge. He was so excited because he spent some time in Australia where he learned about these boots, he LOVES them. So you made his day when being able to get these for our little guy at such a good price! Thanks again for your tips! Best Blog EVER! Oh good... I am so glad that it worked. And thanks so much for the kind words. I hope that you have a lovely holiday season!